New Modbus-capable module delivers Plug'n Play connectivity for industrial systems. 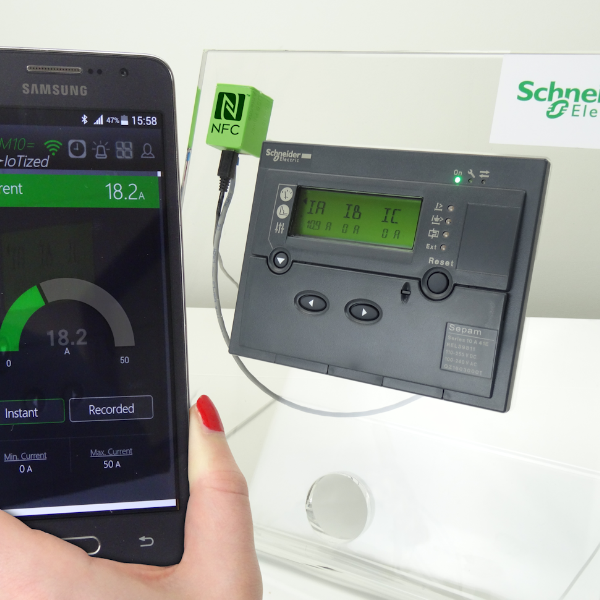 23 February 2016, Nuremberg, Germany – Today, at the Embedded World 2016 exhibition, the IoTize™ design team introduced their smartphone connectivity module with Modbus support for industrial systems. IoTize revolutionizes migration of existing electronic systems to the IoT with its patented plug’n play approach to RF connectivity. This approach allows system designers to add Near Field Communication (NFC), Bluethooth and Wi-Fi to their systems without changing their native firmware/software. Equipped systems can thus interface with smartphones that provide rich, ergonomic control interfaces and a network connection to enable Cloud-based services. The IoTize™ project unites a consortium of experts in microelectronics and security in a collaborative research project that includdes the participation of STMicroelectronics, Gemalto, the Laboratoire Informatique de Grenoble (LIG) and the ISEN engineering school of Toulon. The project will culminate in 2018 with the addition of a complete, scalable infrastructure for cloud-to-core security. The IoTize project is endorsed by the French innovation clusters — Pole SCS and Minalogic, and benefits from national and regional funding. Many industrial applications are overlooked in IoT migration because of their long life spans and the costs and risks associated with their redesign and replacement. The newest generation of IoTize modules demonstrated at Embedded World, responds to this challenge by enabling Near Field Communication (NFC) and Bluetooth Low Energy (BLE) via their Modbus port — a communication standard widely-implemented on existing industrial systems. With IoTize, users benefit from smartphone-based system control, data collection, diagnostics and system updates. IoTize manages multiple user interfaces (ex. operator, supervisor, maintenance, etc.) thanks to configurable data access and user authentication parameters. The smartphone-based network connection also provides data for cloud-based support and maintenance services. And all of this is possible on Modbus equipped systems without modifying their native firmware. Modbus is an open, royalty-free, industrial serial communications protocol. Originally published by Schneider Electric in 1979 for use in programmable logic controllers, it has since become a de facto standard communication protocol for connecting industrial electronic devices because of its simplicity and robustness. IoTize Modbus to NFC/BLE modules are featured in demonstrations at Embedded World, 23-25 February 2016 in Hall 4, Stand 4-103.